If the plank is close to a wall, the easiest way to replace it is by unlocking the planks. As tedious as it sounds, it is worth the effort and time. Begin disassembling the planks by unlocking them. This can be done by disconnecting the tongue of one plank from the groove of the adjacent plank. Here is an easy way to replace a damaged laminate floor plank located in the middle of the room. Although this is time consuming and requires precision, you can take it up as a DIY project. However, make sure you take safety precautions and use the tools as recommended by the manufacturer. With a pencil draw a straight line connecting the holes. This line will guide you when you are cutting out the plank. Take a circular saw and adjust the depth of the saw to the same thickness as the laminate plank. This will ensure you don't damage the sub-floor. Start cutting the center of the plank and use the lines to guide. Continue drilling until you reach the holes on both sides. Now get the same sized laminate plank as a replacement. You may have to cut off the tongue on the long and short sides of the plank to get it to fit into the opening you have made. Also, you may have to trim the groove a little with a vibratory undercut saw for the replacement to fit into place. 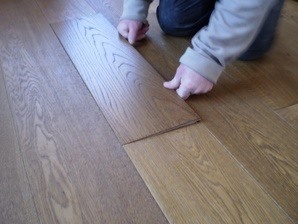 This is the easy way to replace a damaged laminate floor plank. Just remember to follow the steps correctly and you should not have a problem. If you have a doubt about replacing the plank yourself, get a professional to do it for you.